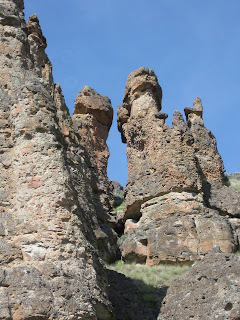 Last spring I went on a trip to eastern Oregon with my hiking group WWW, the Wild Women of the Woods. We stayed at the Lodge at Service Creek, better known as Tilly's Boardinghouse. Tilly's has been catering to travelers since the 1920's. Our group occupied the entire house—17 of us bunking up together in rooms with names like the Painted Hills room, the Rimrock room, the Fish room, the Cool room. Nancy and I shared the Cowboy room. I immediately took down the painting of a scarred and depressed looking cowboy that hung over the bed, a harbinger of bad dreams. I also ran the faucet until the sulphur odor diminished. 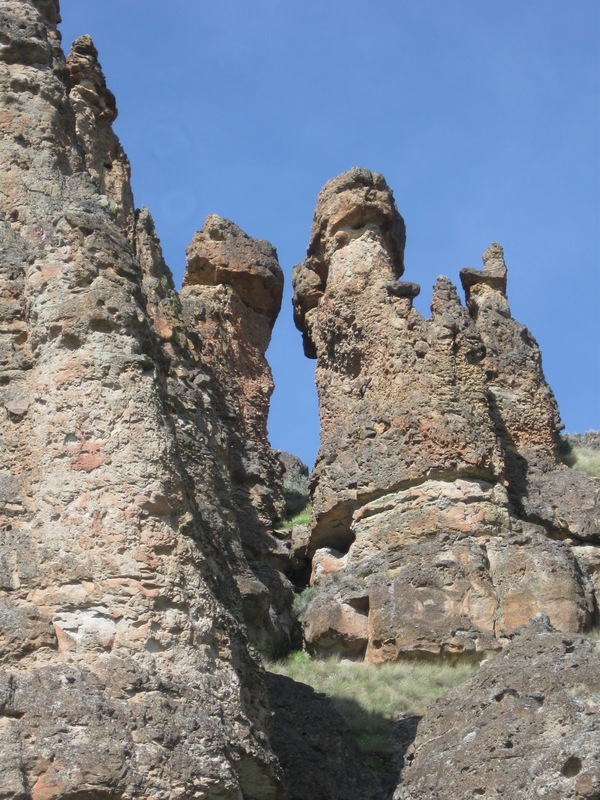 The bed was comfortable, however, and the windows offered spectacular views of basalt cliffs. Nancy and I were relaxing while the others were downstairs having hors d'oeuvres and wine before dinner. Gazing out the window, I had this unexpected visitation. thirty cougars for killing their livestock. the scent of lilacs on this cold day of desert spring. Sunset lit the basalt cliffs. on the switchback between petroglyph and peril. turned toward me with gold in his eyes. Last Saturday afternoon, John and I visited several galleries in downtown Portland. One of the most intriguing exhibitions was at the Blue Sky Gallery, a gallery devoted exclusively to showing works by new and established photographers. 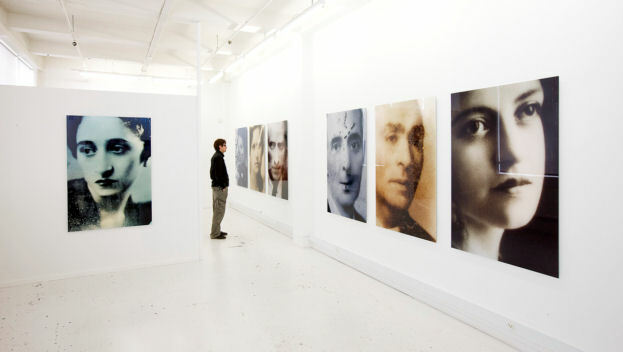 One entire room was filled with large-format 'portraits' taken by Danish photographer Torben Eskerod. The series, called Campo Verano after the largest cemetery in Rome, shows his photographs of the portraits affixed to grave markers at Campo Verano. Eskerod has enlarged the faces of the deceased behind the glass casings, some barely visible due to the scratched and broken glass. And yet their personalities and expressions come through with stark reality. 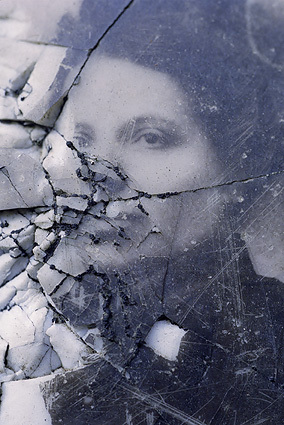 By removing these faces from their original context, they become even more haunting—emerging like ghosts from behind the weathered, discolored, and broken glass. The purpose of these portraits behind glass is to keep alive the memory of the decreased for the living. And yet, the poignancy is that even these nonmortal structures disappear with the ravages of time. I was completely taken by the photograph to the left. The woman's eyes stared back at me, beautiful and refined. I felt the gentle presence of one of my Polish ancestors behind those brutal cracks. John and I spent the afternoon at the Portland Japanese Garden. After last week's storm, everything looked cold and barren. Yet, this is one of the most beautiful times of the year in a Japanese garden—when the 'bones' are in their glory. Sinuous lines of tree branches form natural sculptures against the pale backdrop of winter. We enjoyed being alone in the garden, strolling slowly, remembering it in other seasons. 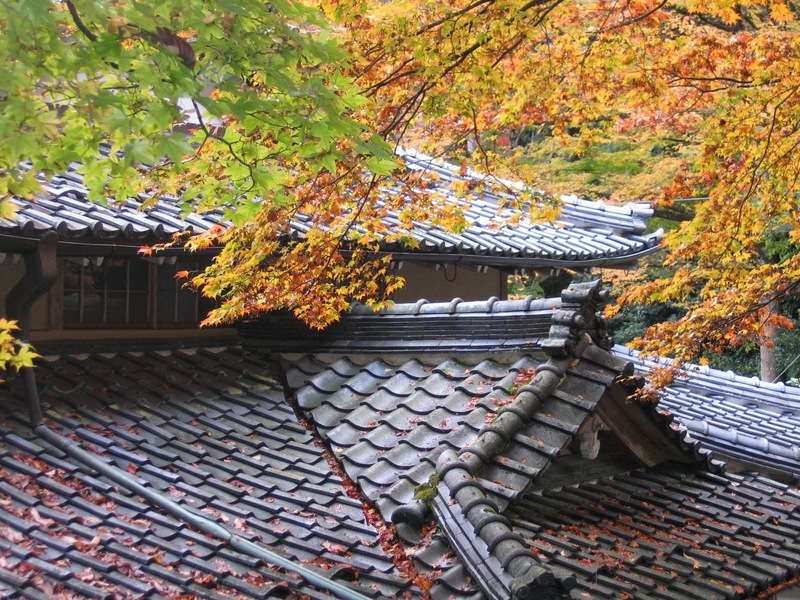 My thoughts returned to winters in Japan—sitting in a favorite temple in the mountains outside Kyoto, warming my hands over an iron hibachi and gazing at the garden. John and I ended our walk on the southeast side of the Japanese Garden pavilion with visit to the suikinkutsu (water harp). On the surface it looks like a water basin with water flowing from a bamboo spout. But buried beneath the ground is an upside down pot with a hole at the top. As water trickles through the pebbles at the base of the water basin it resonates through the underground chamber. The Japanese say it sounds like a koto, a thirteen-string zither, or a bell. To me, it sounds like pleasant splashing. Haiku are from Grinding my ink, which received a Haiku Society of America Book Award. 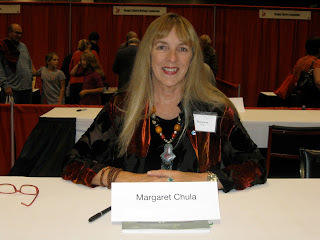 Visit http://www.margaretchula.com for more information. On these cold, rainy days it's pleasant to remember our visit to Hakone Garden nestled in the hills of Saratoga, California. In 1915, inspired by both a lifelong interest in Japanese culture and their travels throughout Japan, Oliver and Isabel Stine purchased 18 acres to build a summer retreat. Isabel hired Tsunematsu Shintani to design the Upper "Moon Viewing" House and Naoharu Aihara to design the gardens. Hakone is the oldest Asian and Japanese estate in the western hemisphere. Strolling through Hakone on a late summer afternoon, John and I felt that we were visiting a daimyo's estate in the mountains of Kyoto. The hillside gardens, unique lanterns, waterfalls, ponds, and meandering pathways were all expertly designed and maintained. 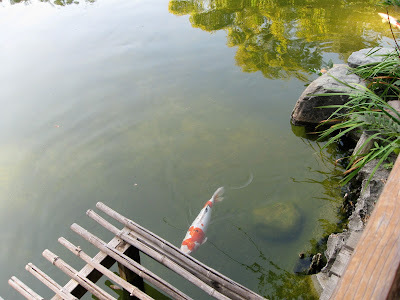 I especially enjoyed watching the koi swim nonchalantly over two huge tortoises in the pavilion pond. Also the wisteria tunnel, which I hope to walk through in the spring when the scent and the buzzing bees will be a sensory delight. If you're fit, climb up the path through the bamboo forest in the late afternoon light. Sit on the pavilion and look out at the "Valley of the Heart's Delight", which is present-day Silicon Valley. While we were resting there, I overheard a man telling a group "Over that ridge is Jiko-ji." The name sounded familiar—my friend Chris Herold had sat meditation in that Buddhist temple many years ago. John and I stopped to talk with them and got invited to visit Jiko-ji, which we did the following day. Good things happen when you're in a beautiful place! When John and I moved to our new home in NW Portland last autumn, I was missing Comet and the guinea hens and the deer that grazed in the pasture at dusk. But on the first day, sitting at my desk in my new study, I had a visitation. Directly ahead of me, just outside the window, was a large rabbit. We stared at each other and I said “Hello, Bunny.” He lingered for quite awhile munching on grass while I wrote poetry on my computer. Occasionally we’d both look up at one another in quiet companionship. The next morning he was there again, in the same spot, gazing at me and grazing. He’d show up in the evening as well, nibbling at the quince. I immediately consulted my dictionary of animal totems: Animal-Speak. It reported that rabbits are known for fertility and new life. This was a propitious sign for our new lives in our house on the hill. Moreover, in Chinese folklore, the rabbit is a sign of sensitivity and artistic abilities. I felt truly blessed. 'No,' I said, 'Hopalong Cassidy.' I realize now, with some sadness, that many people will not get the reference to either one. This spring, another rabbit showed up. A baby. Just one—a very cute one. 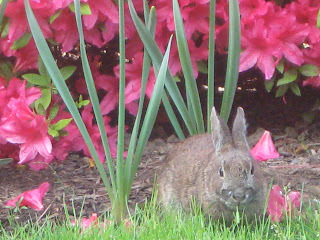 I watched her delicately nibble the grass and then stand on her hind legs to reach the azaleas. I hoped that she wouldn't develop a taste for my beloved peonies. Just to make sure, I put metal cages around the tender red shoots. After a few weeks of daily visits, she became part of the family. I named her Camille after the French poet. A year has passed since Cassidy first visited. Both rabbits come infrequently now. I realize that I know almost nothing about rabbits—their life span, mating habits, hibernation. I do know that coyotes walk boldly down the street at night. My best guess on the location of their burrow is that it's under the hawthorn bushes. With the hawthorn's sharp thorns and thick foliage for protection, I hope that my rabbits are more wiley than the coyote. Name them and they become yours. Think of your children, who are named even before they're born. We name our cars, our books, our homes, our pets. When John and I lived in Kyoto, we inherited two lorikeets from the family next door, who were moving back to England. The birds were always making a ruckus, cooing or chattering to one another. We named them Billy and Cooey. Sometimes we'd leave their cage door open so they could fly around upstairs while we were gone. One day we accidentally left the window open and out they flew. Billy came back, but soon perished from lovesickness. I love books about animals. Growing up in New England, I read all the Thornton Burgess stories. Reddy Fox, Sammy Jay, Billy Skunk were as real to me as my friends in school. When we moved to our grandparent's farm, my sister and I spent weeks taming the barn cats and giving them secret names. I still remember the day Pumpkin was run over. Nana lifted her off the road with a shovel and dropped her limp corpse in the ash pile. I watched from the upstairs window and wept at the unceremonious burial. My friend, Doris Ober, has written a heartwarming book called The Dogtown Chronicles: Our Life and Times with Sheep, Goats, Llamas, and Other Creatures. Doris and her husband Richard populated their ten acres in this small California town with a menagerie of animals: a llama named Lloyd, a ewe named Little Lulu, Scottish Highland steer named Moe and Curly, geese called Mother Goose and Alger Hiss, and goats Mephisto and Isabella, among others. For Doris, born and raised in Manhattan, taking care of animals was a challenge. "Once I understood them, I loved them truly and deeply. This is a most selfless kind of love—love of sheep, love of goats—because understanding them means knowing deep down that they don't love you. Not at all." And we grieve with her when she says, "When they go, there goes part of you. Everything that was between the two of you, vanished." It is emotionally wrenching to lose an animal through separation or death. This is particularly true of dogs, with their unconditional love. Animals are intuitive. They sense our moods and our needs, sometimes even before we do. As Doris says "The grief we have for people who die is much different than what we feel for our pets—even for the people who have seen our true selves, as the dog and the cat and the horse have—because people are not silent, our love of them and theirs for us is conditional." 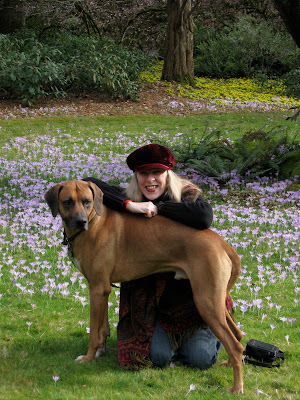 When John and I moved out of the house that we'd rented for seventeen years, we also left behind our landlady's Rhodesian ridgeback. Comet spent much of his time at our house; keeping me company as I gardened, sleeping on our porch on hot summer nights, romping and kicking up his heels in the pasture. He was always ready to jump into the back of John's van for a hike, whether we were just walking locally in Tryon Creek park or setting out for an arduous hike in the Columbia River Gorge. Although we did not name Comet or own him, we felt that he was our dog. And he was—for awhile. 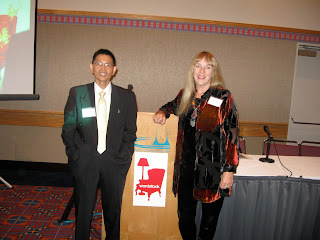 On October 9, a large crowd gathered in the Wordstock room at the Expo Center in Portland Oregon to hear Kilong Ung and me read from our new books. 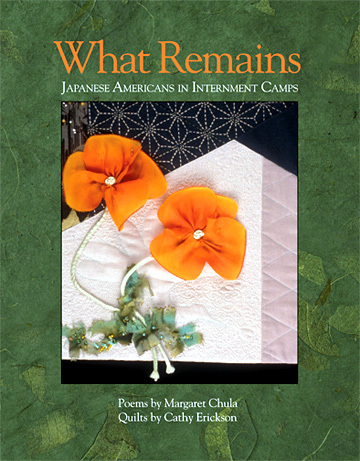 I began with poems from What Remains: Japanese Americans in Internment Camps, illustrated by posters of quilts by my collaborator Cathy Erickson. Kilong read from his memoir Golden Leaf, A Khmer Rouge Genocide Survivor. The audience was in tears hearing about his last moments with his mother before his parents were taken away and killed. Only he and his sister survived. Our readings were a departure from the plethora of coming-of-age novels and New York Times best seller authors, offering a more reflective and somber note to the weekend of literary events. Powells' Books sponsored a book signing following each reading. 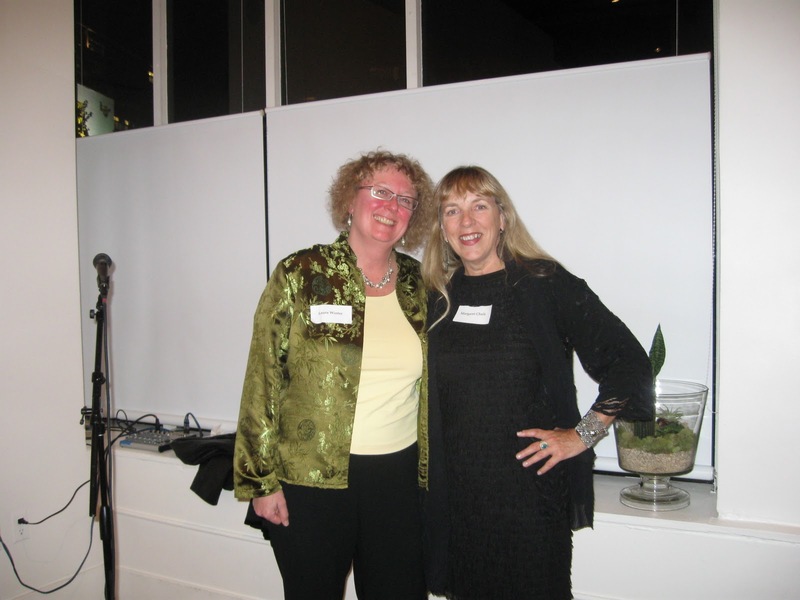 It was fun to meet the other author's who had presented at the same time as me. Because there were six events each hour, I was unable to hear many of my favorite author's read, which was frustrating. The high jinx of Wordstock occurred at the Authors' Party held the evening before at the Cleaner's Event Space adjacent to the Ace Hotel. 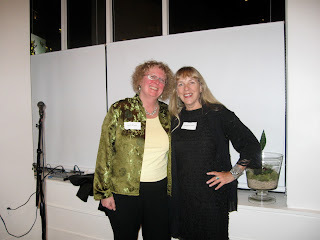 Wine and conversation flowed smoothly and laughter bounced off the walls and ceiling. I met Chelsea Cain outside the Ace Hotel. 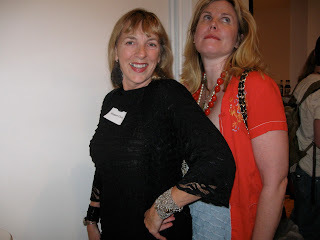 We were wearing the same lacy short dress; hers was pastel blue, mine black. This definitely called for a photo! Then there was Laura Winter, performance artist and poet. We had a good time perched in the corner, our wine and cheese waiting on the windowsill as we talked about our creative ventures and "Po Business". Today 10-10-2010 is my birthday. After weeks of activity—giving programs and poetry readings, traveling, teaching workshops—I decided that today I would do as much of nothing as possible. In my readings, I learned that the number ten signifies that the cycle is complete and that everything is in its proper order. Whatever thoughts and feelings are put out on this day will manifest or multiply three times. I began to feel that I was inside a cocoon of peace—memories of walking in the cedar forests of Ohara, monks chanting at Sanzen-in, their breaths visible in the cold morning air, fields of pink cosmos swaying in the wind, the sound of an invisible stream. And I wondered why all my memories of tranquility were set in the past and in another country? Returning to my body sitting on the cushion, I came to the realization that this moment 10-10-10-10-10 would never come again. What if we lived our lives this way? Cherishing each moment or even each day? After chanting and meditation, I opened Daniel Skach-Mills’ book The Tao of Now to a random page. Here’s the poem that came to me today. to execute and follow your plans? The Dao of Now is available at Amazon.com and at the Lan Su Chinese Garden gift shop in Portland. Come to Wordstock, Portland's gala literary festival, featuring Portland's finest poets, writers, and publishers. I'll be giving a reading from What Remains: Japanese Americans in Internment Camps, a seven-year collaboration of poems and quilts with fiber artist Cathy Erickson. 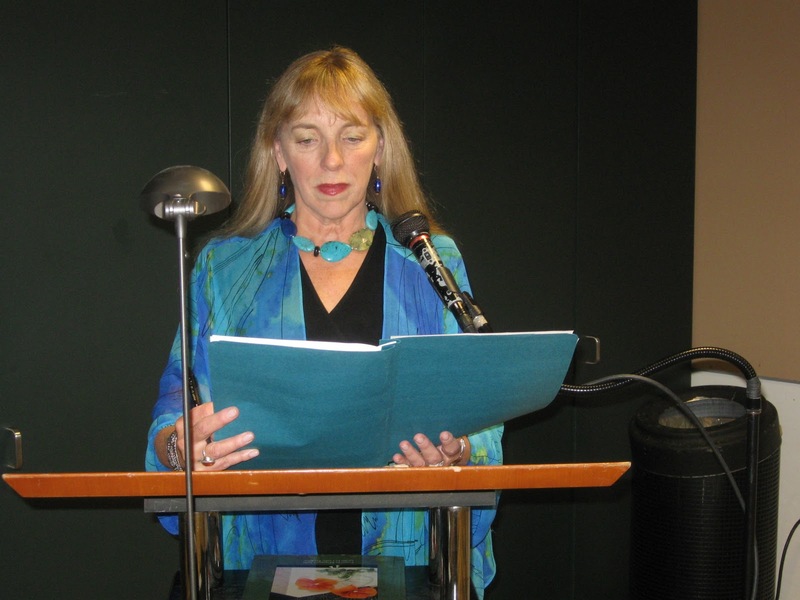 The reading begins at 2:00 on October 9 on the Wordstock Stage. I'll be sharing the stage with poet Kilong Ung, a Cambodian genocide survivor, who will read from his book. While reading each poem, I'll show an image of Cathy's accompanying quilt and then talk about how I used the color, texture, shapes and images in her quilts to create my poems. 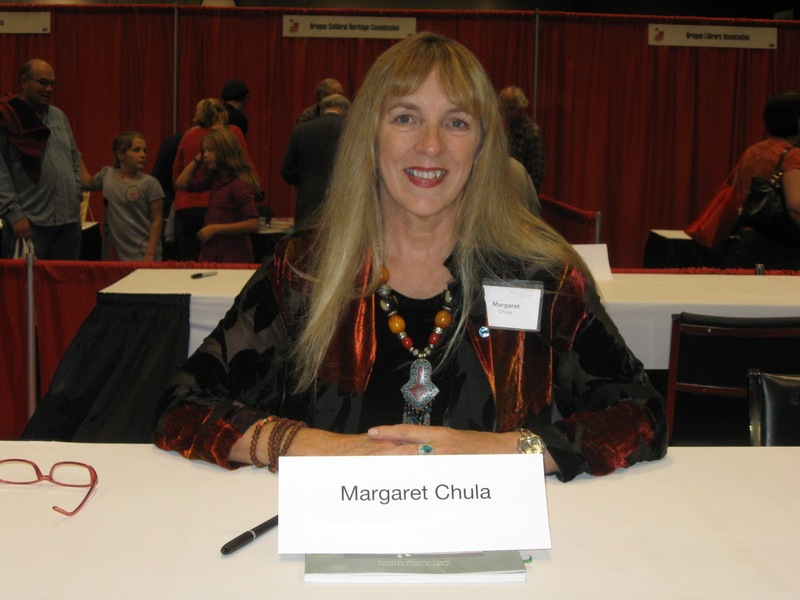 Visit my website http://www.margaretchula.com to hear me read poems from What Remains. Cathy's quilts can be seen on her website www.cathyerickson.net. Exactly nine years ago on the morning of September 11, I awoke in Portland smelling smoke. I searched the house thoroughly. There was no fire, yet I felt uneasy. At that moment, on the east coast in New York, planes were crashing into the Twin Towers. 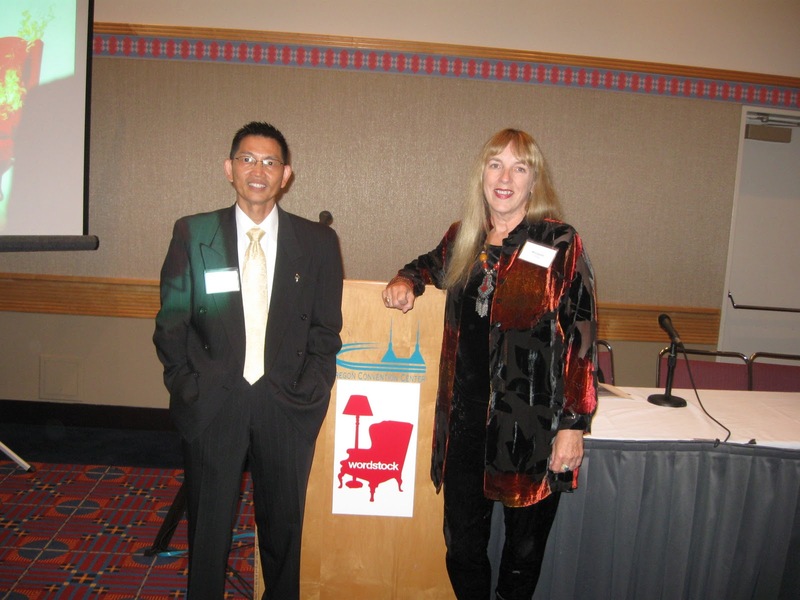 Now on September 11, 2010, quilt artist Cathy Erickson and I presenting our book What Remains: Japanese Americans in Internment Camps at the Japanese American National Museum. The room fills up early. Many of the audience were imprisoned in internment camps during World War II. Others are second- or third-generation Japanese Americans who learned about the camps in school, not from their parents, who were too ashamed or emotionally scarred to tell them. September 11 is a day to reflect on not only the loss of innocent lives, but also the dissolution of human rights. After the bombing of Pearl Harbor, over 120,000 Japanese Americans were rounded up and transported to ten concentration camps in desolate areas of the country. Seventy percent of them were American citizens. Fifty thousand were children. Not one was ever convicted of a disloyal act. We begin our presentation with projected images of Cathy’s quilts. 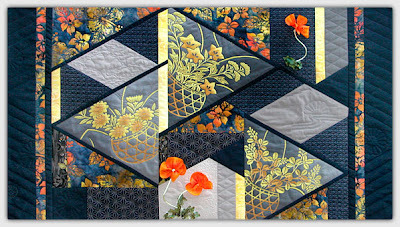 The audience oohs and ahhs at their beautiful colors, textures, and creative patterns. As I read my accompanying poems—in the voices of a young boy/a grandmother/a dancer/a carpenter/a teen-age girl—I hear women in the audience quietly weeping. 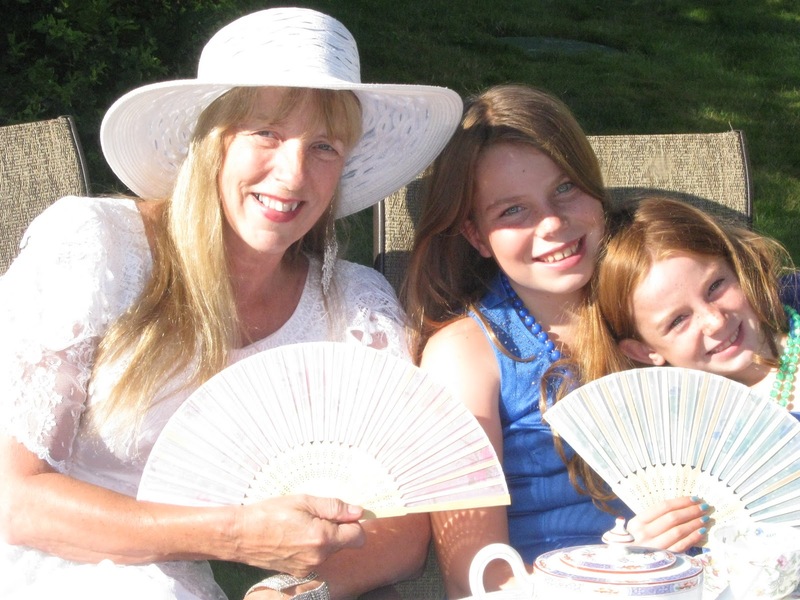 On a hot July afternoon this summer I treated our granddaughters Shaina (10) and Angela (8) to a tea party in the back yard. But before the party, we needed to find appropriate outfits. "Where are we going?" they asked from the back seat. "On a magical mystery tour," I replied. (We were giving their parents a day off to shop and relax.) John had gallantly offered to accompany us. First we stopped at Trilogy to get a Marx Brothers movie, then to the library for some books to carry them through the week, and finally to our destination—GoodWill, the mother store. First, the dresses. The three of us crowded into one dressing room and tried on dress after dress. John stood patiently outside the dressing room and gave his opinion on each outfit. The girls ended up with two dresses each and even I found one that may have been a wedding gown! "Great," says John, "can we go now." Oh, no, we have to find accessories and maybe some shoes. " At the jewelry counter, they each chose beads to match their dresses. Shaina found a pair of shoes and Angela a long flowing scarf. Back at home, I brought out all of my mother's and mother-in-law's tea cups, saucers, and a flowered teapot. Yellow daisies, cookies, peppermint tea, a pastel tablecloth, and Japanese fans, completed our party decor. We spoke of gentle things: the rabbit Camille who we had left weed clippings for, the beautiful white roses, the abundant raspberries that we picked each morning for our cereal, and how lucky we were that we were girls and could play dress-up. Late afternoon on a cloudy spring day. John and I stop to visit our friends Bill and Gwil in Corvallis, Oregon. They have invited us to view their garden, Momiji-en, inspired by the Portland Japanese Garden back in the 1970's when it was being designed. Before I even enter the house, I'm drawn to the outside altar with statues of Kuan Yin, tiny bonsai, and bamboo lattice. This is going to be a real treat! Bill and Gwil welcome us with green tea harvested from the tea plants in their garden. The taste is rich and deep, earthy and green, but not bitter. 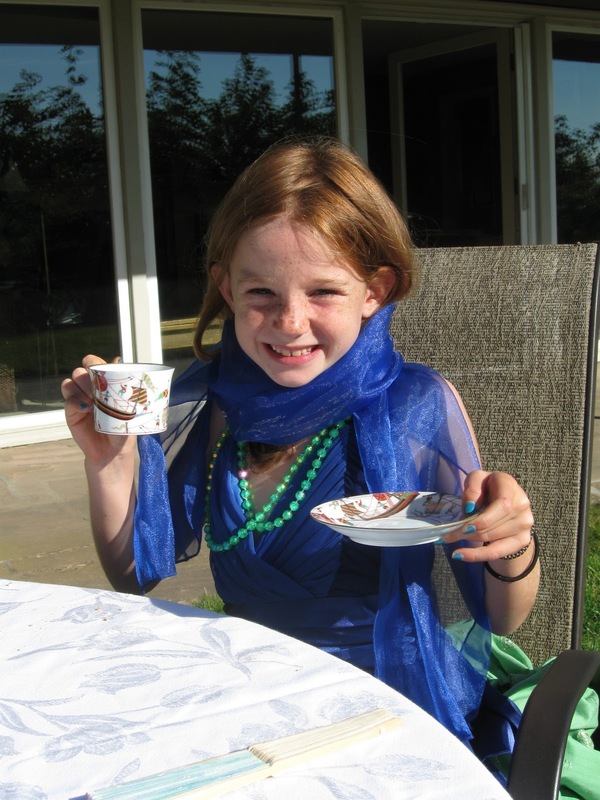 Complementing the tea, they serve thin ginger wafter and gelatinous sweets eaten with an elegant toothpick. We view the garden from the vantage point of royalty and poets seated on a pavilion, but this one is inside. We stroll the dewy path leading to the tea garden. Rounded irregularly shaped stones slow the guest down, inviting him to enjoy the sounds and smells and textures of the garden. Everything is perfect here—thirty years of designing and maintaining a garden that rewards them with beauty through every season. Bill and Gwil have spent most of the day candling pines, a meticulous task that leaves your fingers sticky with pine pitch. They give John and I pointers as we have several pines in the backyard of our new home. At one point on our garden tour, Gwil takes out his I-phone and begins punching buttons. He's much too polite to be checking his phone messages while we're there. Intrigued, I ask him what he's doing. "I'm regulating the flow and sound of the waterfall," he says. And, sure enough, as we stand there attentively, we can hear the variations. In late March, I traveled across the country to help my mother move into an assisted living facility. She had been living in a Victorian house which had been converted into independent living for elderly women but, for the last couple of years, she had difficulty navigating the stairs. On each visit home, we would sort through a drawer. Last year it was the "scarf drawer." All the scarves were arranged by color, nested in tissue paper, and scented with all the exotic soaps I had sent her. On another visit, we winnowed down her jewelry, a more daunting task. This time we had a deadline, April 1. I looked around her room, in her closet, on the sun porch. Yes, we could finish in four days. What I didn't realize was that each hanger in the closet held two blouses and the portable closet on the porch was packed full of clothes. "There may be some more up in the attic, too," Mother said quietly. There were. She presided over the sorting while sitting in her recliner chair, directing me how to fold the clothes that were being given away, where to put the clothes she was taking with her, and keeping an eagle eye on me so I wouldn't sneak anything into the trash. I held each blouse up—about 300 of them, including a soiled dickey from the 1940's—for her scrutiny. We made three piles: take with her, give to her friend with a big family, and donate to the Survival Center. Several blouses had stains on them. "Oh, put them in the corner and I'll wash them later," she said. "Mother, we have to be out of here in three days. You don't have time to wash blouses." My mother is ninety-four. She lived through the Depression. At the end of three days' work, about a hundred hangers surrounded us. She sorted through them, tied them all up by size, shape, and color and put them in the hallway with a sign: "Free Hangers." On the porch were bags and bags of bags: plastic, gift, and paper. Also a large collection of rags, neatly cut into squares and rectangles—all pressed and folded. When Mother turned ninety, her hip began to bother her and she reluctantly gave up golf. My brother, also a golfer, carried her golf clubs down from the attic and placed them near her chair so she could enjoy them for a few days. Her matching short sets and golf shirts went to the Survival Center, where they would probably not be worn by golfers. On moving day, my brother and his son-in-law came and hauled all the clothes, books, and furniture to the assisted living center. When Mother and I arrived, the rooms were filled with boxes to be unpacked. We decided on the arrangement of the furniture quickly and where to hang the art work. Next we needed to go to Walmart to purchase some necessities: a shower stool, towel hanger, curtains, bins to store her clothes, a table cloth, and some yogurt and fruit drinks. The excursion would require a lot of walking—too much for Mother. But there, lined up at the Walmart entrance as promised, was a fleet of electric cars. "Whatever you do, don't get in front of her," the store clerk advised as Mother took a seat. At first she navigated the aisles in fits and starts, but once she got the hang of it, she took off—literally. I went up and down the aisles calling her name for about five minutes, then heard the back-up "Beep! Beep!" and there she was. Two hours later, we were in the check-out line. "I never could have done this without the electric cart. It's good to try something new!" she said proudly." 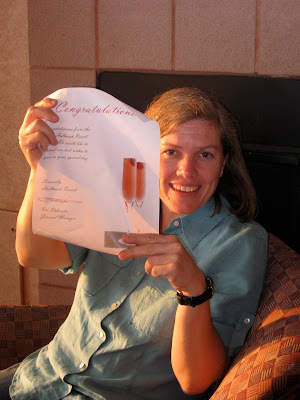 We celebrated her success by going out to lunch. Although Mother's new accommodations were beginning to look homey, the kitchenette still looked antiseptic and cold. I remembered what a friend said to me when John and I moved into our new home: "The first thing you should do is buy a tea kettle and sit down and have a nice cup of tea." So I went out and purchased a small red teakettle. It looks cheerful in her spick and span kitchen, a burst of color welcoming Mother to this new phase of her life. On Sunday, April 18, I gave a poetry reading at the Feast of Poets in Silverton Oregon at the Silver Falls Vineyard with Donna Prinzmetal, Colette Tennant, Mary Szybist, and her husband Jake. I was tempted to change 'catalpa blossoms' to 'lilacs'. At the end of the reading I asked the organizer if I could have one branch to bring home. "Oh, I trimmed off the tops of my tree. It was getting too big. You can have all of them," she said and bundled the lilacs up and put them in my trunk. The two-hour ride to Portland was delicious. When I arrived home I said to John, "Look, honey, I caught the bouquet!" I arranged the lilacs in six bouquets. They perfumed our house for a week. Ichi go ichi e, one time, one meeting. Now is the only time that exists. No other tea ceremony will be like this one. The guests will change, the taste of the tea will be different, the light slanting through the shoji will be brighter or dimmer, the chabana will wilt and a new flower will replace it. Japanese poetry, too, offers this appreciation of the moment, both in our experience of nature and in the process of writing. Murata Shukô (1422-1502), abbot of Daitoku-ji in Kyoto, turned away from the gaudy tea ceremonies of Japan's ruler Toyotomi Hideyoshi and introduced a new aesthetic, soan-cha, or thatched hut tea. Soan-cha focuses on the relationship between host and guest, emphasizing the spirit and mind of the host rather than his technique. This aesthetic is echoed by Matsuo Bashô, who sought the subtle, the refined, and the spiritual in everyday life. Your poetry issues of its own accord when you and the object have become one, when you have plunged deep enough into the object to see something like a hidden glimmering there. In haiku, nature is our host and we are her guests. By attuning ourselves to our surroundings, we open our hearts and minds to what is. The four principles underlying the way of tea—harmony, respect, purity and tranquility—embody the spirit of Japanese poetry as well. Takeno Jôô (1502-1555) took Murata's soan-cha one step further to include the spiritual ideal of wabi. Wabi, he states, is honesty, prudence and self-restraint, both emotional and material. Before coming to tea, Jôô studied linked verse, so it is not surprising that he turned to Fujiwara Teika's waka to illustrate wabi. Cherry blossoms and crimson leaves refer to the extravagant tea ceremonies sponsored by the wealthy in their gold-lined tearooms. Bashô, too, cautions against ostentation: A haiku is like a finger pointing at the moon. If the finger pointed at the moon is bejeweled, one no longer sees the moon. Sen no Rikyû (1522-1591) sought unity with humanity and nature through tea. The thought of the host shall be that of the guest. The thought of the guest shall be that of the host. Bashô reiterates this unity when he says: Learn of the pine tree from the pine tree and of the bamboo from the bamboo. Wa embodies a quiet simplicity, a feeling of oneness with nature and people. Like his teacher Jô, Rikyû quoted poetry to convey his views on wabi. Fujiwara's waka tells those living a luxurious life in the capital that he has come to appreciate the beauty of restraint and understatement. The pathos of young grasses among snow evokes the feeling of sabi, the spiritual depth of loneliness and tranquility. In The Way of Tea, Rand Castile says that wabi spirit prepares for the guest known to come. Sabi spirit prepares with no thought whatever for a guest. Sabi spirit is necessary when writing poetry—inspiration comes to us when we keep our minds open, without goals or expectations. Perhaps the best illustration of wa in tea ceremony and poetry is to compare a chaji (formal tea ceremony) with a renga (session to write linked verse). Each of these is highly structured with rules and procedures. When a clear etiquette of procedure is established between the host and guests through constant repetition, kata (forms) appear for each kind of action. Observance of these kata leads to harmony between host and guest, guest and guest, and mood and season. Like the chaji, renga were traditionally held in the serenity of a Japanese tatami room. Each gathering has a master as host. The order of guests is fixed in advance; the most honored guest is seated nearest the tokonoma (alcove). The main guest in a renga opens the session by composing a hokku (first verse), which flatters the host. The shokyaku, first guest in a chaji, receives the first bowl of tea. He is also responsible for leading the others in the etiquette of entering and exiting the tearoom, as well as directing the conversation. The progression of these two occasions corresponds to the unfolding of a Noh play with its jo (overture), ha (intensification) and kyu (finale). The mood of the first six verses of a 36-verse kasen renga is similar to attending a party—honoring the host, making poetic overtures and relaxing with each other. A chaji also begins informally with a meal and sake being served as guests relax and socialize. The highlight of a chaji is the solemn koicha, thick tea ceremony. Guests quiet their minds as they observe the master preparing tea. Each drinks his/her bowl of tea, after first acknowledging the guests yet to be served, and then compliments the host. The middle/development section of a renga (ha) moves into an outré spirit as participants link and shift in unconventional ways. The goal is to keep the flow lively and entertaining. 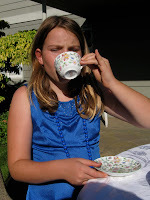 To signal the end of the chaji, guests are served usucha, thin tea, and perhaps some hot water to purity their palettes. A renga winds down in the last 6-8 verses. The penultimate verse involves cherry blossoms (the crowning piece of the sequence), and the closing verse ends on a light tone, generating an atmosphere of peace and warmth. One meeting, one time. On both of these occasions, participants are not the same as when they began. The za has enjoyed many pleasant hours together creating a renga. Host and guests of the chaji leave the tearoom refreshed and tranquil. Three kinds of respect are observed in a chaji and a renga: respect for the host and other guests, respect for materials, and respect for the seasons. Days before the chaji, the tea master makes meticulous preparations for the comfort of his guests. In winter the fire is laid before the food is served in order to warm the guests. In summer, the hearth is farther away and the fire is laid after serving food. The host walks down the pathway, which he has swept and watered, to greet his guests, who enter the tearoom on their hands and knees through the nijiriguchi. This 'crawling in entry' eliminates all distinctions of rank or class. Guests honor one another through ceremonial responses. For example, before drinking a bowl of tea, a guest bows to the one sitting next to him and says Excuse me while I go first. Similarly, in a renga, each poet reflects on and appreciates the previous poet's verse before composing his own. Participants also pay tribute to poets of the past by addressing them directly or by alluding to their poems. Respect is extended not only to people but also to the utensils used. Each utensil in a chaji is selected with the intention of creating a harmonious atmosphere. Rather than antiquated art objects, they are like a mirror upon which the host's mind is reflected. Bowls, tea scoop, and whisk are handled with care. Every motion has its own rhythm. For example, the tea master picks up the tea scoop or container a little faster than he puts it down, similar to the enthusiasm of greeting a friend and the reluctance of saying good-bye. After tea has been consumed, the first guest inquires about the artist who made his tea bowl, the whisk, and the tea container as well as the meaning of the poem inscribed on the scroll or the flower in the alcove. Items are passed around with reverence for the guests to appreciate their beauty. But the early morning moon. The materials used in a renga are words. Its success depends on skillful linking through allusion, resonance, symbolism, association and then shifting by means of juxtaposed images. Great pleasure and enjoyment come from appreciating and responding to each other's cleverness and wit. Creative use of language allows for a diversity of subject matter and tone, which are essential to the spirit of renga. Seasons play an essential role in both a chaji and in composing waka and haiku. Indeed, haiku is defined as a poem recording the essence of a moment keenly perceived, in which nature is linking to human nature. In Traces of Dreams, Haruo Shirane emphasizes that in a renga the seasonal landscape became the fabric out of which the sequence was woven. While making preparations for a chaji, the host reveals the essence of a season through his choice of utensils and foods, flowers, the kimono he wears, the scroll and even the method of preparing tea. Rikyû's fourth rule, In summer suggest coolness; in winter, warmth corresponds to Shirane's statement: If a haikai occurred in summer, the hokku had to avoid the word ‘hot', and in winter he could not use the word ‘cold'. Sei embodies cleanliness and orderliness in both the physical and spiritual senses. In chanoyu (tea ceremony), purity begins with the physical surroundings. The garden has been weeded, swept and watered before the guests arrive. The tearoom and utensils are spotless, yet the host wipes them again in front of the guests to cleanse his mind. Guests too perform gestures of purity, such as rinsing their hands and mouths at the water basin and removing their shoes, swords and jewelry before entering the tearoom. To fully enjoy chanoyu or renga, participants must cleanse their minds as well. The ideal of furyu, from the words ‘wind' and ‘to flow,' suggests that our spirit should flow through life like the wind that flows through nature. Furyu embraces the imperfect and incomplete—in chanoyu, the partially opened flower in the tokonoma; in haiku and waka, images rather than concrete words, what Shirane defines as the poetics of lightness. Soshitsu Sen XV of the Urasenke tea school states: Haiku cast a stone in the water with the brevity of seventeen syllables, but the ripples extend endlessly into the reader's heart and mind. Another aspect of furyu is lack of symmetry. Japanese haiku and waka contain uneven numbers: three or five lines of seventeen or thirty-one syllables. Everything in the tea room appears asymmetrical—the architecture, the number of tatami, the imperfect shape of the utensils and even the flowers, which are not arranged as in ikebana but placed in a vase as they grow in the field. The vase, too, is always placed off center in the tokonoma. Both chanoyu and Japanese poetry also exemplify the aesthetic of karumi: lightness, simplicity, leanness, avoidance of abstraction, relaxed artless expression, understatement. A tea ceremony is held in a four-and-a-half-mat tatami room using implements made of natural materials, such as bamboo and gourd vases and the imperfect teabowls. The overall impression is one of refined poverty rather than ostentation. Haiku and waka poets too aim for this simplicity in their use of everyday language, subtle and evocative images, and restraint. Emotions are conveyed through suggestion and, like a scroll painting, space is left for the reader to fill in with his/her own experience. This restraint is illustrated in the story of Rikyû and his patron Hideyoshi. In the fourteenth century, morning glories were difficult to grow, but Rikyû's grew in profusion. Hideyoshi asked Rikyû to hold a tea ceremony in the morning so he could view them. Rikyû agreed. But when Hideyoshi walked down the stone pathway in the outer garden, no morning glories could be seen. Not along the path, nor floating in the stone water basin. When he stooped to enter the tearoom, however, he was astonished to see a single morning glory hanging from a vase in the tokonoma. It is an especially Japanese sensibility towards beauty to cut away and cut away, abbreviating to the point where nothing more can be removed and thereby creating a thing of great beauty. Jaku is a Buddhist term that is often translated as the sublime state of nirvana. Indeed, tea master Sen Sotan, grandson of Sen no Rikyû, said that the taste of tea and Zen are one and the same. Chanoyu, the Way of Tea, offers a setting and a ritual for finding tranquility through the constant practice of harmony, respect and purity in everyday life. Poetry too enhances our lives as we experience the rhythms and essence of the natural world or the camaraderie of fellow poets. Both chanoyu and poetry offer a path of discipline and practice through contemplation and reverence for life, an opportunity as Soshitsu Sen XV says to transcend our false images of ourselves. Published in Hermitage, A Haiku Journal, Rumania, Volume III, Nos. 1 & 2, 2006.